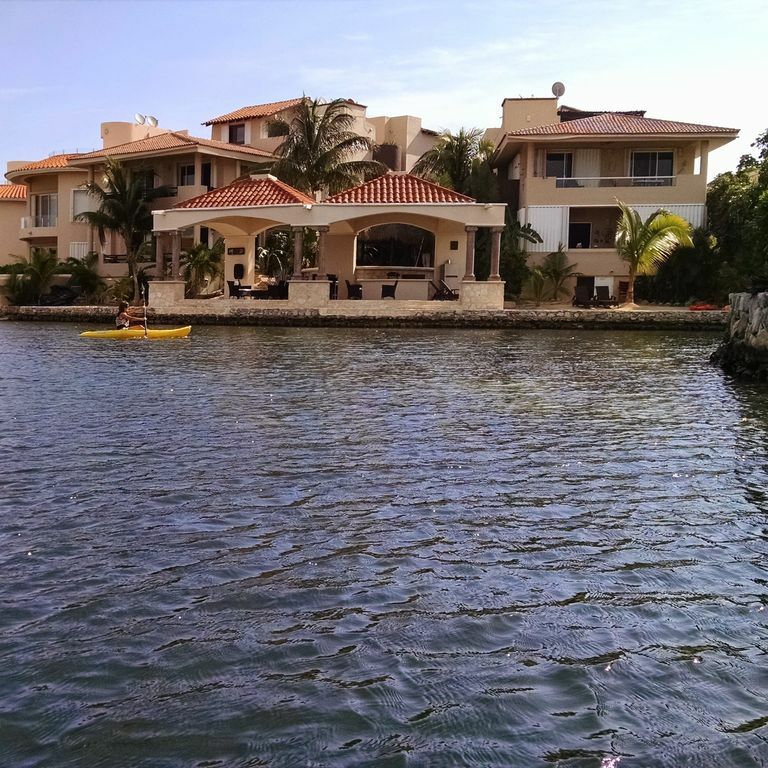 Water front penthouse condo in gated Puerto Aventuras (PA). Condo is ready use and comes with 2 person kayak.. Pergola with hammock on the roof. The lagoon is calm for children to explore the small islands and leads out to the ocean. Puerto Aventuras has many restaurants and shops as well as swimming with the dolphins. Unique condo has three outside walls with terrific views of the lagoon as well as the ocean. Watch beautiful sunsets from the solarium. Enjoy cool breezes while laying in the hammock under the shaded Pergola. Newly added beach pergola and improved walkway and parking lot. My wife is a travel agent and we traveled all over the Caribbean searching for a fun place that was easy to get to. PA is about a half day trip from our home and located in the middle of all the activity of the Mayan Reviera. We enjoy exploring for new adventures and cultural activities. We wanted a location that offers lots of outdoor and water activities. PA is the best location that provides a combination of social life and privacy as well. Our condo has windows on three sides with terrific views. Being on the lagoon you can enjoy swimming in a calm area and swim out the ocean as well. PA is self sufficient with resturants, dolphins, golf, etc. It is centrally located between Xcaret and Xel Ha and few minutes from Playa Del Carmen. Our condo complex offers the security of a locked entrance gate and beautiful landscape with palm, lemon, and banana trees. A sand beach with stepped seawall to the lagoon. A large gazebo with grill on the beach for seating for the entire family. Solarium offers additional seating and table with a beautiful view of the lagoon and ocean. One wall mounted air conditioner in each bedroom and living room. New parking lot with overflow in court area. hIgh speed Interent available at no charge. Roku installed on TV. TV with DVD player and Roku. No Cable. Stereo CD player. Gas oven requires manual lighting. Setting for up to 6 people. Complete with blender, toaster, coffee maker, drinking water dispenser, tables setting for 6 people. No cable service but we have a drawer full of DVDs. Several 2 person kayaks available located right on our beach. Puerto Aventuras has a 9 hole golf course expanding to 18 holes soon. Outdoor pool for Bellmare tenants and guest only. We enjoyed our three week stay. Gil was very helpful and answered our questions very promptly After we arrived Gil gave us a tour of Puerto Aventuras in his golf cart showing us the restaurants, bakeries, stores and especially the ice cream store. A couple of minor problems we had were promptly taken care of. There is a nice lagoon in front of the condo surrounded by other condos with many kayaks paddling around. The condo does furnish a 2 man kayak Two things should be noted. There are no sandy long beaches facing the ocean that are readily accessible. It is also a 3 1/2 miles round trip walk to the heart of the town where the restaurants, stores, etc are located, so you will get your exercise. You can rent a golf cart for $30/day which I thought was high. We took the walk most every day to eat, buy something but mainly to get ice cream. Wow! When I say paradis, I mean it! What a gorgeous panoramic view from either the condo roof top, balcony, poolside or under the pergola. My sister and I were very comfortable spending five weeks there. If you enjoy walking this is the place to be. My sister and I walked to the market every Wednesday and Saturday, we walked the beaches, we even walked to the Chadraui (the grocery store) across the highway. We did take a taxi going back; too hot! The condo featured two huge bedrooms with king size beds, lovely kitchen/dining/ living room. There’s also a laundry room. Very convenient. We asked Gil & Nancy for new pots and a frying pan for the kitchen. We received them two days later. The sink in the master bedroom needed some work, the shower in the main bathroom needed a good cleaning, especially the floor. All the small kitchen appliances needed a good scrubbing too. The condo itself does need a little bit of TLC. We would have appreciated a phone call from Gil or his manager Nils every once in a while to see if everything was ok or if we needed anything. PR goes a long way! No reason to ask for a jug of water every third or fourth day. There are more pros than cons to this place. It’s worth a visit! The beautiful white sand ocean beach is about a 1 minute walk or a 5 minute kayak ride through the lagoon, and the delicious restaurant and dolphins cove are just 10 minutes walking or a very short car or bike ride. We loved Dos Chiles restaurant, we sat there drinking piñadas eating delicious mexican food while watching the dolphins do tricks and swim with the tourists. Definitely go to Xcaret and Xplor while you're in the area, and don't pass up Tulum, Coba, and Chichen Itzá. Playa del Carmen is just a 20-30 minute drive up the road and has a beautiful boulevard and plenty of great facilities. I got sick from eating some street food and I was able to get a free consult and the prescription i needed at the Walmart in Playa del Carmen and was feeling better in no time. We couldn't be happier than we were with this paradise for our honeymoon and we can't wait to come back, especially for the price! Great spacious condo is A nice area. Good access driving to cenotes, Talum, Acamal, and beaches. Be aware the are NO public beaches within Puerto Adventuras. We were generally able to walk through the resorts to the beach, but my husband was stopped when he tried to. If you have a car, there are plenty of "beach clubs" where you can pay small amount to use beach. Also snorkeling and kyaking right from condo was awesome. Nearby restaurants and dolphins were fabulous. In terms of condo, things were somewhat worn. Washer worked with a little love, coffee maker worked if we poured the boiling water through, pans are chipped and few, sheets are yellowed and torn, refrigerator on its way out. Put your beer in the freezer. There is no jacuzzi. Steps to roof top are very steep so a little difficult for people with balance issues. Owners and local management were very responsive, even on Christmas weekend. My apologies for your inconvenience. We appreciate your comments because it is the only way we know how to make improvements. First of all, the water front beaches are open to the public. It is considered Federal land and if anyone tries to imply you can't walk on the beaches they are wrong. So, our manager replaced the coffee pot and fixed the refrigerator. Seems the door wouldn't close properly and they repaired the seals. We are coming down there in two weeks with replacement bed sheet. Had no idea they were in bad shape. We are concerned about these things. Thank you for bringing this to my attention. My 87 year old mother had always hoped that one day she could visit Mexico. Well, her dream came true when my husband and I took her to Puerta Adventuras for a week, and we stayed in Gil and Nancy's beautiful condo. The condo has a gorgeous view over the lagoon , and we frequently enjoyed watching the kayaks go by as we drank coffee on the deck. The condo itself is spacious and clean and the air conditioning cools the place very quickly when needed. We enjoyed a morning swim in the pool each day and a few barbeques in the communal barbeque area. You can walk to the beach which is just over the road or use the kayak and paddle out to the ocean which my mom really enjoyed. I felt Nancy and Gil went over and above to make sure we enjoyed our stay helping us pick up groceries on the first day to allowing us to use their golf cart, so my mom would not have to walk to the village in the heat. Thanks Nancy and Gil for such a memorable holiday! Across from Qunita Luna by the bridge. Golf cart rental available at $25 per day.